We kept delaying trying to transition our baby from the RnP to the crib because we were afraid that she would stop sleeping through the night. The RnP is supposed to be good for babies up to 25lbs, but everyone will tell you that it’s not quite true. At 4 months and 15lbs, our baby looks oversized and squashed in the RnP, even though she sleeps well in it. So we finally tried the transition this weekend. I read a blogpost that was on the sidebar link on the sleeptraining sub-Reddit on how to transition from the RnP, and I’ve seen other posters describe their experience. 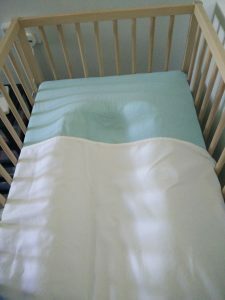 We only adopted one of the modifications suggested for the transition, the U-shaped towel to make the crib more cosy and less open. The U-towel fit nicely even though the bedsheets were tightly fitting. We made one other change prior to the transition: we stopped swaddling her, and started putting her in a sleeping sack. She’s been escaping her swaddle for a long time now, but the RnP is a rather warm bassinet so we haven’t been too bothered by it. But she would be completely exposed in the crib when she escapes her swaddle. We put her in a sleeping sack for a couple of nights, and she was fine with it. The first night, we let her sleep in the RnP for 30 min before shifting her to the crib. She slept for a long time till she started fussing at 8am from hungar, and couldn’t go back to sleep after the dreamfeed. We wanted to sleep longer so we put her back in the RnP, and she fell right back to sleep. The second night, we put her directly into the crib after she fell asleep, and she slept till 9am with a 4:30am dreamfeed. The same happened the 3rd night. So far so good. She is waking up earlier than before, at 9am instead of 11am, but she is also compensating by taking more naps during the day. While I think the transition went okay, we’re going to keep the RnP for a while longer in case we have to deal with the dreaded 4 month sleep regression. I regret not taking more pictures of her when she was a newborn in the RnP. My little girl is growing up.